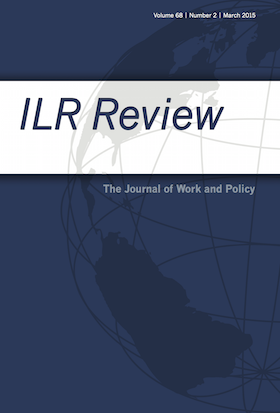 For more than 70 years, the ILR Review has been at the forefront of publishing peer-reviewed research on work and employment relations. The Review, published by SAGE Publications, is part of the Cornell University ILR School, which is regarded as the leading academic institution focused on the world of work. We are dedicated to international and interdisciplinary research that advances new theory, presents novel empirical work, and informs organizational and public policy. Rules without Rights: Land, Labor, and Private Authority in the Global Economy. By Tim Bartley. Reviewed by Mari Sako. Reducing Inequalities in Europe: How Industrial Relations and Labour Policies Can Close the Gap. Edited by Daniel Vaughan-Whitehead. Reviewed by Thomas Prosser. Workers without Borders: Posted Work and Precarity in the EU. By Ines Wagner. Reviewed by Markus Helfen. Politics at Work: How Companies Turn Their Workers into Lobbyists. By Alexander Hertel-Fernandez. Reviewed by Jake Rosenfeld. Working for Respect: Community and Conflict at Walmart. By Adam Reich and Peter Bearman. Reviewed by Maite Tapia. Social Movements and Organized Labour: Passions and Interests. Edited by Jürgen R. Grote and Claudius Wagemann. Reviewed by Ian Thomas MacDonald. Receive notifications of new issues, early release articles, and announcements. Worker Voice in America: Is There a Gap between What Workers Expect and What They Experience? By Thomas A. Kochan, Duanyi Yang, William T. Kimball, and Erin L. Kelly. January 2019. ILR Review 72(1). Editorial Essay: From Cautious Optimism to Renewed Pessimism: Labor Voice and Labor Scholarship in China. By Sarosh Kuruvilla. October 2018. ILR Review 71(5). The Poverty Reduction of Social Security and Means-Tested Transfers. By Bruce D. Meyer and Derek Wu. October 2018. ILR Review 71(5). Introduction to a Special Issue on the Impact of Immigrant Legalization Initiatives: International Perspectives on Immigration and the World of Work. By Maria Lorena Cook, Shannon Gleeson, Kati L. Griffith, and Lawrence M. Kahn. August 2018. ILR Review 71(4). How Credible Is Trade Union Research? Forty Years of Evidence on the Monopoly–Voice Trade-Off. By Hristos Doucouliagos, Richard B. Freeman, Patrice Laroche, and T. D. Stanley. March 2018. ILR Review 71(2). In Search of the High Road: Meaning and Evidence. By Paul Osterman. January 2018. ILR Review 71(1). Governing Work and Employment Relations in an Internationalized Economy: The Institutional Challenge. By Paul Marginson. October 2016. ILR Review 69(5). Austerity and the Future for Gender Equality in Europe. By Jill Rubery. August 2015. ILR Review 68(4). Is U.S. Public Sector Labor Relations in the Midst of a Transformation? By Harry C. Katz. October 2013. ILR Review 66(5). The American Jobs Crisis and Its Implication for the Future of Employment Policy: A Call for a New Jobs Compact. By Thomas A. Kochan. April 2013. ILR Review 66(2). The New Great Debate about Unionism and Collective Bargaining in U.S. State and Local Governments. By David Lewin, Jeffrey H. Keefe, and Thomas A. Kochan. October 2012. ILR Review 65(4). The Labor Market Four Years into the Crisis: Assessing Structural Explanations. By Jesse Rothstein. July 2012. ILR Review 65(3).